This post will be short and sweet since I'm going out of town for a few days, but I couldn't let another day pass without sharing this recipe! This is an absolutely delicious white chocolate cocoa, and it couldn't be easier to make. The original recipe uses full-fat ingredients, but I've lightened it up a bit. So feel free to go crazy with copious amounts of whipped cream or even giant oven-toasted marshmallows. 1. Place skim milk, half and half, vanilla and white chocolate chips in a large pot, and place over medium heat. Stir occasionally until chocolate chips begin to melt, then reduce heat to medium-low. 2. Cook, stirring occasionally until mixture is very hot and chips are melted. 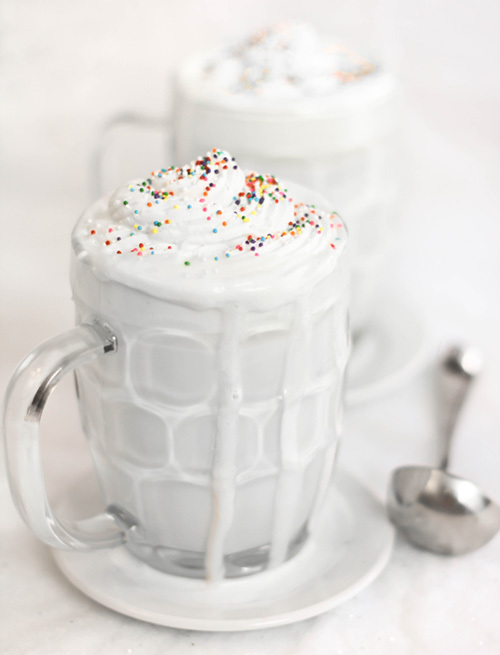 Divide mixture between mugs and top with whipped cream and sprinkles. Serve immediately. Note: If the mixture is left for very long at room temperature, the fat from the white chocolate will rise to the surface. Be sure to gently re-heat the mixture a give it a good stir before serving! this looks divine!! Can't wait to try it! (I think you forgot the vanilla step in the directions.) Thanks for the great recipe! YUM! I agree with Dharma - beautiful presentation! It's there Anonymous, in step one! And thanks so much!! Sounds like a fantastic idea, Heather! I'm a huge fan of cocoa and have a mug everyday after dinner...every single day! This would be a nice idea to change up that routine a bit. I would LOVE some of this! Gorgeous and oh, so, so slurp-able! I want it! I love white chocolate, so much. yum.. this is going to be a snack for me some night this week after a long day! I can't wait for you to come out with a cook book.. and where did you get this glass mug? You are amazing girl. This couldn't be more perfect for this blog...I love the mug! Looks so so good and I love the sprinkles on top. it's a windy day! i definitely need some hot cocoa! Looks heavenly! Thinking peppermint white chocolate would work well too... Yummy! Thx! White, warm and whipped- my dream hot chocolate! I've been playing with white chips here all week and can't wait to give this a go with some of my leftovers! mmmmmm yes yes yes! I am such a lover of white chocolate (over milk!) This looks sooo good..bookmarking and sharing this one! This is my favorite hot drink! Looks lovely. Love this especially for those of us who prefer vanilla over chocolate. Yum! This sounds fabulous, and I love that it uses lighter ingredients, unlike most hot cocoa recipes. I may have a way to use up some of my leftover white chocolate from truffles I made for my cousin's wedding. Oh my GOSH I can't even take this. I want! Que ricura... chocolate blanco caliente, una tentación golosa golosa! It's to gorgeous to eat Heather!!! Want. Need. Yes a need for certain! Just gorgeous my dear! I want to chug this. Love the super-white photo with the rainbow sprinkles. Just lovely! This drinks makes me happy!! It looks so good it almost seems artificial! Can all this goodness be true? Have a great getaway! Gorgeous - I'm bookmarking this post for next Christmas! Just looking at the pretty sprinkles -- and thinking about the chocolate -- makes me happy! GOrgeous and yummy. My favorite combo. I have been looking for a recipe like this for a long time, thank you. Beautiful! Wish I could reach into your pictures and try some right now!!! This looks almost too good to be true!! I'd have to add a bit of pink food coloring to it, of course :) Love it!!! I just melted a little when I saw that mug of beautifulness! What a great recipe! This looks soo good. I love the little sprinkles on top! Cute. I am definitely trying this soon. This is gorgeous and sounds fantastic! And look at you lightening up the recipe for us... so exciting!! :) Can't wait to try this! Just found your blog via Pinterest. So glad I did. Your food looks delish and your pictures are awesome. Good job! This looks fabulous!!!! I don't think I've ever had a white chocolate, and I've never had a hot chocolate that looks this good! I love the sprinkles on top! excuse me, I'm italian and I don't understand very well the english. what do you mean "2 cups fat-free half and half"? what is fat- free? Freakin' yummm! It's snowing here in Michigan... and I think I'll need to warm up by making me a mug(s) of this!! What a perfect idea, especially since we're having a snowy day here in Michigan. I have a serious crush on your blog so I had to write a blog post about it:) Check it out. love the picture! i love how no one really thinks about making hot cocoa with white chocolate? Yippie!!! It is hard to ever find a white hot chocolate..this looks DIVINE! Thanks. What a beautiful and brilliant idea! My daughter would love this! YUM! This looks much tastier than the white hot chocolate version I've been using in the past. It was mostly milk and sugar. The addition of white chocolate is a much better idea! I bet my family would love this! I think it's supposed to snow tomorrow, maybe we'll find out what they think. This is awesome I have to try! where is that mug from?????? I need it! Thanks for sharing - yum!! What a brilliant way to "de-calorize" a sumptuous, unique, wintry favorite! Setting aside the coldest day in December to give this a test-drive... Thank you! Vanilla-Rosewater Cupcakes for the ModCloth Blog!